For the lion’s share of modern businesses, staying competitive is the name of the game. And that’s certainly true for the team at CenMac Metalworks, a family-owned manufacturing company founded in 1960. For them, one of their most winning strategies for staying competitive is completely avoiding outsourcing jobs. Retaining control of turnaround time and quality by not outsourcing has given the company the competitive edge it has needed to stay in business – and successfully so – throughout its nearly 60 years in operation. 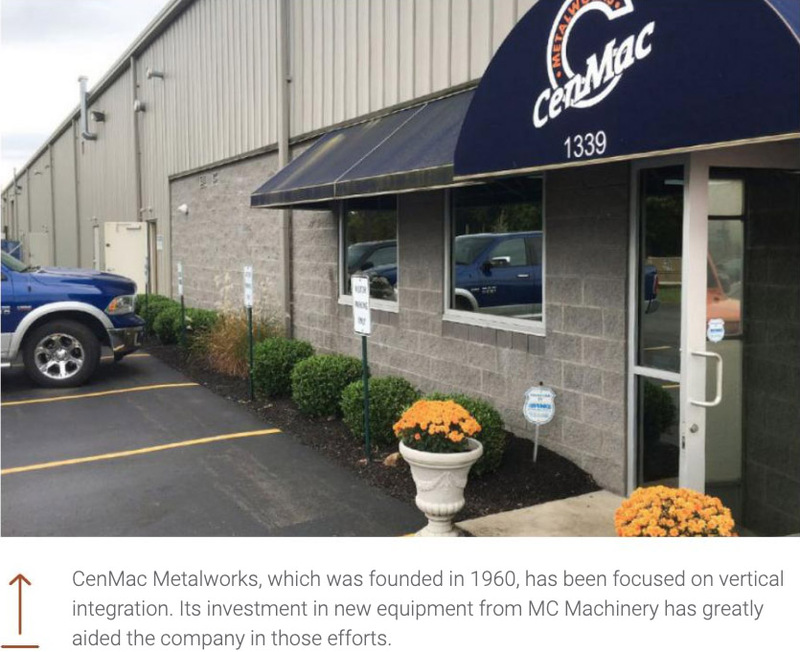 To retain control of operations, CenMac made a commitment to vertically integrate, leading the company to specialize in a wide range of fabrication processes, including laser cutting and forming, CNC machining, manual and robotic welding, plasma cutting and stamping, among many others. With those skillsets, there’s little the company can’t do. With customers always top of mind, CenMac isn’t afraid to step out of its comfort zone and invest in new technology – even when the company isn’t exactly sure which direction customers or the industry might go next. Through every new venture and fabricating project, the team has considered MC Machinery Systems Inc. as a trusted partner for new equipment. Some of that equipment includes 1-kW and 4.5-kW CO2 lasers as well as a new 8-kW fiber laser, all of which are equipped with full automation systems for the most cost-effective and productive operations. Geared toward higher volume jobs, the CO2 lasers with automation run an average of 130 hours per week. 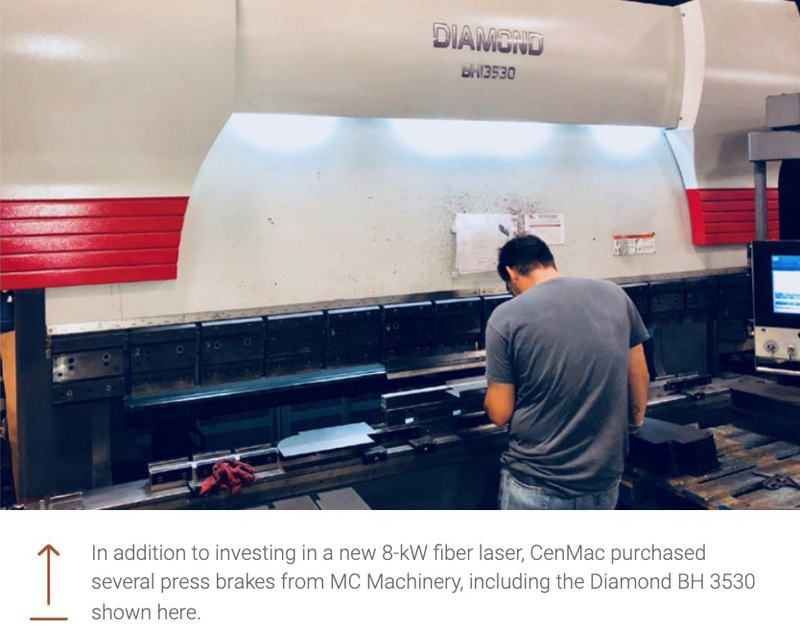 The goal for 2019 is to have the new 8-kW fiber laser running more than 100 hours per week. 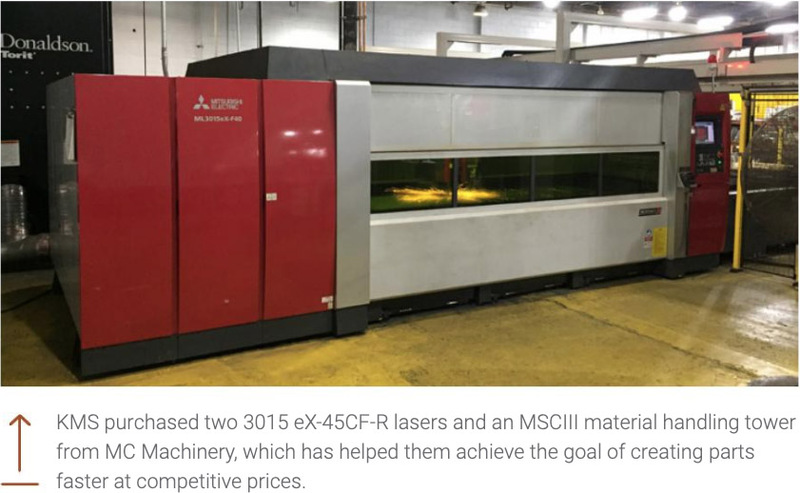 Undoubtedly, the company will achieve those goals – increased order processing with shorter turnover times – thanks to the automation built into MC Machinery’s fiber laser systems. Available machine automation includes automatic focusing and beam manipulation, among other features. Monitoring software also enhances overall operations as it can automate reporting for machine diagnostics and order processing. The company also owns several MC Machinery press brakes, including a BH 3530, a BH 1353 with 150 tons of pressure that is capable of handling workpieces up to 10 ft. long and two electric BB 6013 55-ton press brakes for shorter workpieces. The BH series is one of the top lines available from MC Machinery, meaning it offers automatic thickness detection as well as other features, such as high positioning accuracy and energy savings. While the company didn’t purchase the new laser and press brakes to meet any specific challenge, Ken Hall, CenMac plant manager and his team are always looking for ways to make improvements. Currently, CenMac operates at near full capacity, using the new equipment to complete different types of work. In addition to the speed of the fiber laser, Hall has found the press brakes offer fast setup, too, which helps the company’s operators be more productive. Due to the company’s success, it will expand its facility this year by adding 30,000 sq. ft., for 60,000 sq. ft. of total space. The plan is to move the fiber laser and press brakes into the new space. As with CenMac, MC Machinery serves as a valuable partner to KMS, a fabrication company with facilities in Pennsylvania and South Carolina. The company relies on MC Machinery for technology and equipment that can help the company reach its goal of faster production times. Since its start 60 years ago, KMS has grown from a two-man welding operation to a team of more than 200 employees. Today, the company supplies American Fortune 500 companies with precision-fabricated sheet metal parts, ranging from small-batch prototyping to large production runs, while spanning the spectrum of materials and methods. KMS serves customers in the HVAC, food service, electronic and heavy-duty trucking industries. 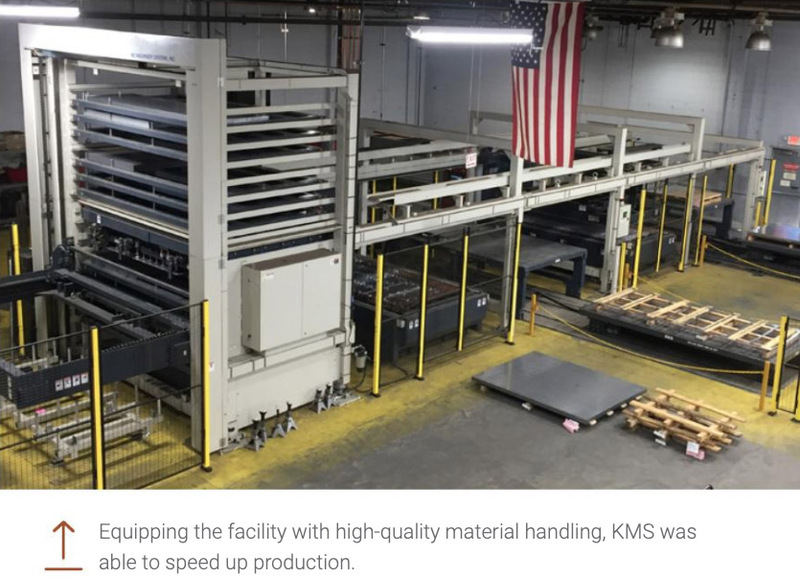 The company has been an MC Machinery customer for about two years, a partnership that began when KMS needed to create parts faster at competitive prices due to an expanding customer base. KMS made the decision to purchase two 3015 eX-45CF-R lasers with an MSCIII tower and a second fiber optic machine for its South Carolina location. The machines continually help the company be more productive and run more efficiently. KMS also takes advantage of MC Machinery’s remote360 laser monitoring software for its Mitsubishi lasers, which helps operators monitor the status of the machines remotely. They can receive messages on their smartphones or via e-mail notifications when there are any issues. The web-based application provides real-time access to an extensive amount of data, including machine operation and alarm states, maintenance timers, active alarms, diagnostics, program header content and active job information. Adam Hartman, vice president of operations at KMS, says the remote360 became an essential tool during lights-out production and that the Mitsubishi lasers have sped up their processes. After exploring MC Machinery’s offerings, KMS purchased two BH Series press brakes. The company needed multi-axis back gauges for larger parts with tapered or angled flanges, and because the Mitsubishi press brakes offer 5-axis back gauges, the company can now make corrections much quicker than before and can also make adjustments without much hassle. Hartman adds that, like MC Machinery’s lasers, the press brakes are incredibly user friendly and fast to set up. They also offer quick tool changes.